Just back from the Catlins, where we spent four days in glorious (for there anyhow) weather. The ocean was still a little cold for my taste, but there were quite a few surfers in the water. I did a little writing while I was there, but really the weather was so nice I just wanted to be outside. Given the fact that the sun doesn’t set until about 10:15 PM at this time of year that makes for some pretty long days! In the evenings I amused myself by making a cardboard model of a Viking ship. It took a lot of cutting and gluing. I have never tried anything like this before and I found it quite enjoyable, although I don’t think my results looked exactly like the picture in the book. Next I have an Elizabethan warship to put together, and it will be even more difficult. One day we drove further along the coast to a place called Curio Bay. 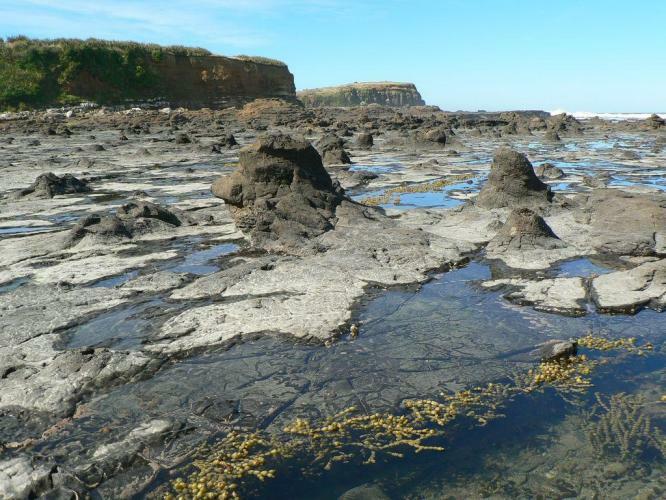 It is a natural rock shelf that the tide washes over, full of interesting tidal pools. You can see the occasional yellow-eyed penguin. But the most amazing thing is the petrified wood forest of stumps and fallen trees. These were laid down during the Jurassic period, back when NZ was practically at the South Pole and part of Gondwanaland. It is an amazing place. I just finished week five of C25K. The last run was twenty minutes in a row. I did it!